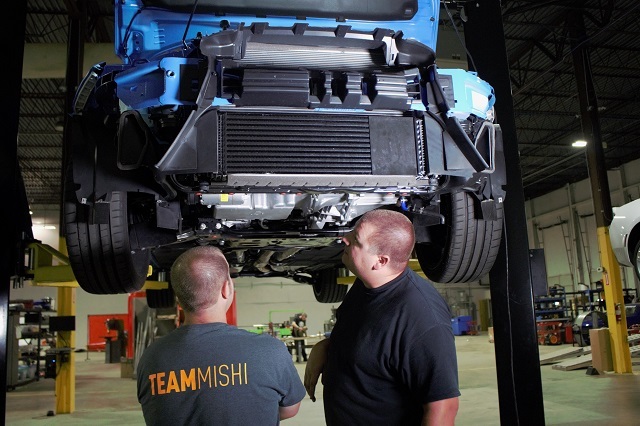 Team Mishi is hard at work developing an entire line of cooling upgrades for our RS. Up to bat is one of the more popular modifications for turbo cars: the intercooler. The stock Focus RS intercooler is an interesting part of this hot hatch. As soon as images of the striking front end of this car surfaced on the interwebs, many noticed that there was a black plate blocking off a portion of the intercooler, and immediately called it out. 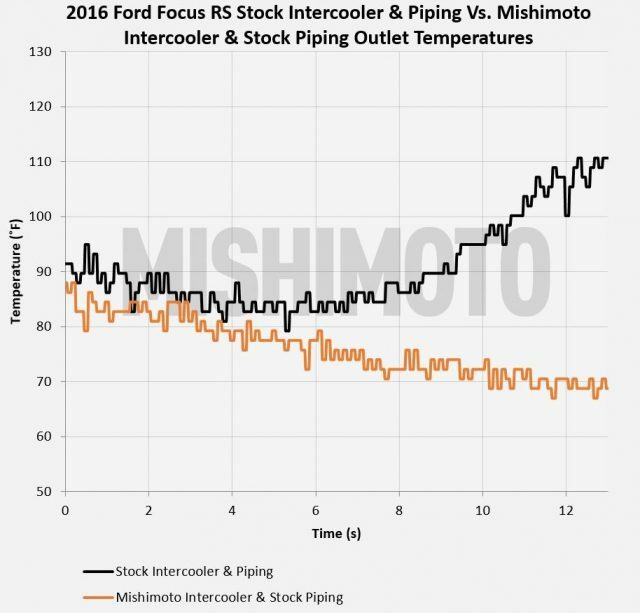 Ford explained that the intercooler was too efficient and that, in humid climates, the excess efficiency caused condensation within the intake tract. Although we had been warned, like any horsepower-hungry enthusiast, our first thought was how to get rid of this plate. After having a closer look at the block-off, we found that it is not permanently affixed to the intercooler. 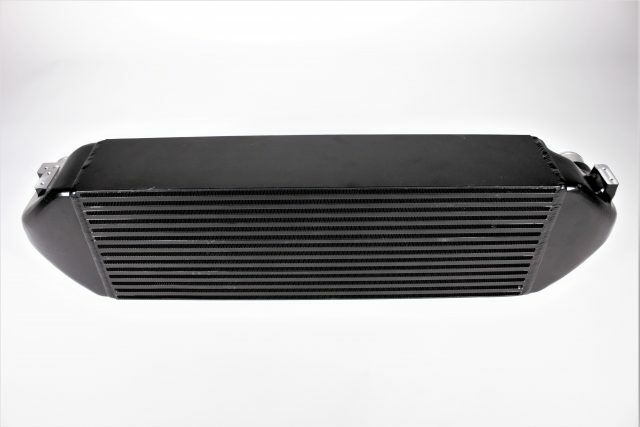 It is a small piece of plastic attached to the front of the intercooler with a strong adhesive. It can be easily removed, although Ford advises that you leave it in place and insists that there are no power gains hiding behind the block-off. Not to worry, our minds have already been racing with ideas for our own intercooler project. The stock intercooler is fairly large, at least as far as stock intercoolers go. 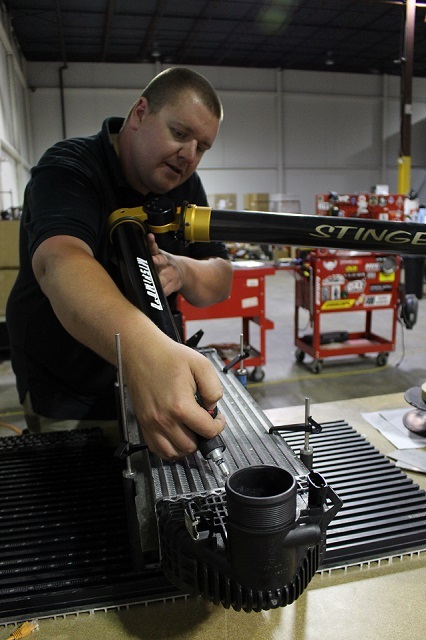 Using tube-and-fin construction with plastic end tanks, it is your run-of-the-mill stock intercooler. Since we believe that there is always room for improvement, we removed the intercooler and began to take some measurements. With the help of our CMM (Coordinate Measuring Machine) and our Romer Arm, we uploaded the dimensions of the stock intercooler into Solidworks to begin to design our prototype. Next up we will take a look deeper into the development process and begin to create prototypes for test fitment. Let us know what you think of the stock Focus RS Intercooler in the comments below! Don?t forget to check out our other Focus RS projects, like the Focus RS catch can, on our engineering blog. Take our poll and let us know what you think about our core options HERE. Some time has passed since the last update for this 2016 Ford Focus RS intercooler project, but that doesn’t mean we’ve forgotten about it! It’s all-hands-on-deck to get this project back in the swing of R&D. Let’s see what it looks like and quickly go through some of the design specs. Speaking of the end tanks, those on our intercooler are cast opposed to cut-and-weld. 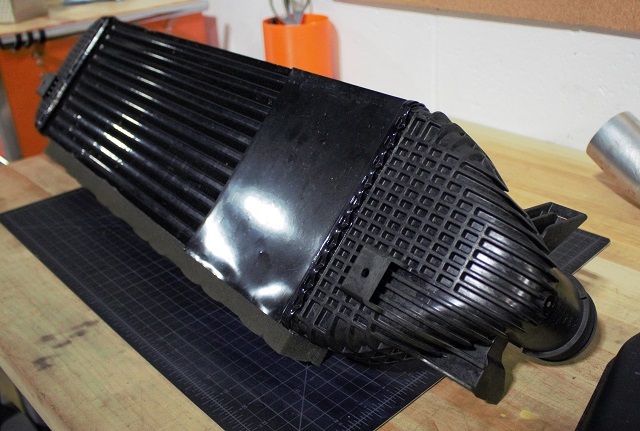 So instead of cutting pieces of the end tank and welding them together, the entire end tank is cast in one mold, giving you a very sturdy product. We also went with a bar-and-plate core design. We did this for two reasons; 1) it’s a more durable design with greater cooling capacity and 2) we polled your thoughts on the subject and it was a no-brainer. We polled across two online RS-specific forums and you guys were 96% in favor of a bar-and-plate design. Can’t argue with cold, hard data! It's been a long time guys, but we have some pretty cool updates coming next week. Stay tuned! I sense intercoolers are ready soon. 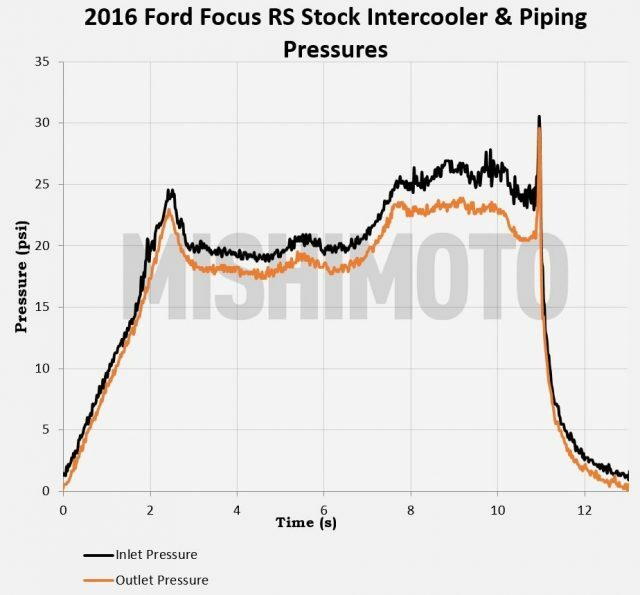 The movement on the 2016 Ford Focus RS intercooler project may seem slow, but it couldn’t be more alive. 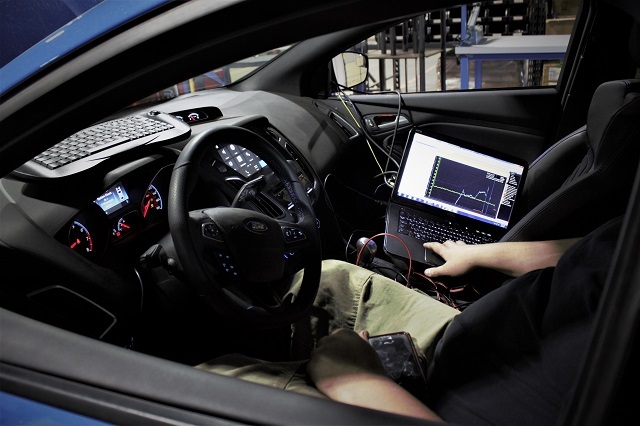 Our lead engineer for the project, at my request, has completed a plethora of testing configurations to get the most detailed amount of data possible. 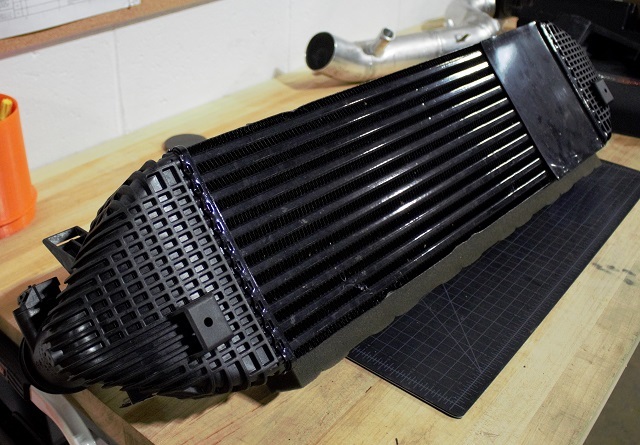 For the past three months, we have been rocking out on testing, testing, and more testing for the RS, the primary objectives being movement on the upcoming diff cooler and this front-mount intercooler. We know that the RS crowd loves their data, so we want to overload you with what’s finally available. I won’t sugarcoat anything here. The update is going to be very data-intensive. I don’t have any entertaining anecdotes, interesting fun-facts, or puns about staying focused to fluff this piece with. Today’s discussion will be about our Nitrous Blue hatchback and the focus on data. Let’s start with temperature reduction, because this is a big one. 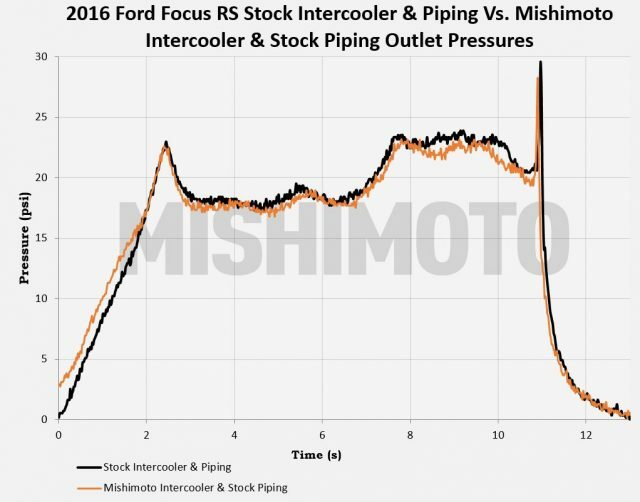 With any intercooler, the main purpose is to reduce the amount of hot air forced induction carries to your engine. Cooler means denser, which generally means more power. This RS has a decently sized intercooler, but you can bet we can do better. During testing, we noticed that the factory intercooler heat soaked quickly while making dyno runs. 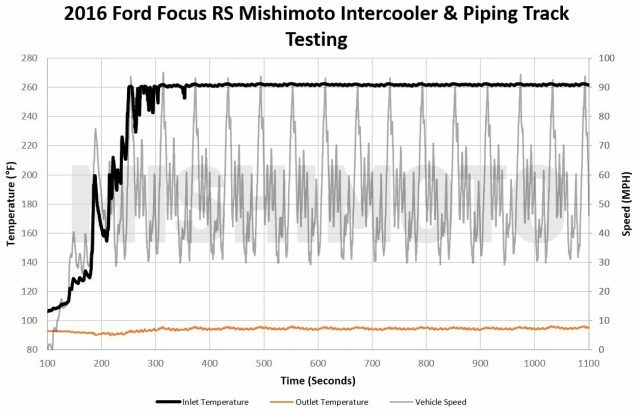 By the end of our dyno runs, our engineer saw outlet temperatures of around 110˚F. A new thermal imaging camera we’ve been experimenting with helped confirm the temperature recordings. Below are frame shots of dyno runs taken with our thermal camera. Hot areas are highlighted in brighter, red colors. As you can see, the stock intercooler lights up rapidly and the heat quickly spreads throughout the entire core. there is a lot of warm air your intake manifold breathes in, and it sort of goes against the purpose of an intercooler. Our prototype core gets warm right at the inlet, but the air is immediately cooled through the rest of the intercooler when it makes its way to the outlet. This is mainly due to a core that is two inches thicker and an external fin surface area that is 214% larger stock. The heat transfer is so efficient here, reducing the outlet temperatures by over 40˚F, and, yes, we have the data to prove it. Our intercooler dropped the outlet temperatures to around 68˚F, which was nearly the ambient temperature in our garage. Now I know what you’re thinking. This test wasn’t done at speed, so how could this be an apples-to-apples comparison of what your prototype could do in the real world? I happen to have another project that crosses over, containing that exact information and backing our shop-simulated data. Touching back on the sophisticated rear differential unit (RDU) cooler currently in the works, our shop RS took a trip to the track to test the prototype cooler unit. The car was equipped with pretty much everything we currently have on the market for it, which by design was important because our shop Stig really had to abuse the thing. 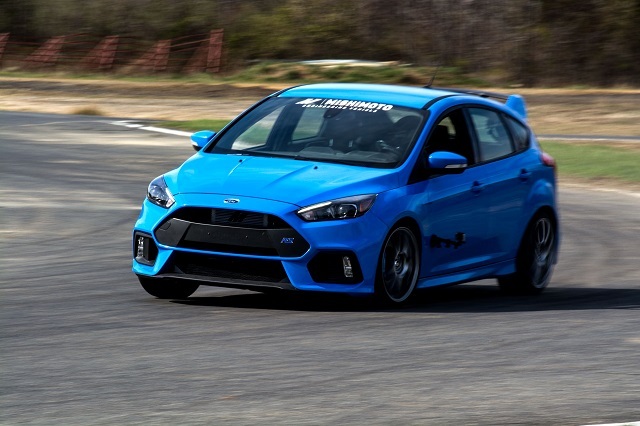 Our team took a day to go to Englishtown, New Jersey, running the RS at the local race track there. I won’t go into the specifics of what they were testing with respect to the RDU cooler, but the lead engineer for that project engineered this intercooler, so what better time to test the limits of his prototype design? Disclaimer! The data includes runs done with our intake, intercooler, intercooler pipes, and a tune. While this isn’t a true comparison to our shop-produced dyno data, this will still give you an idea of how we are validating our claims. As you can see, even at speed, we kept our outlet temperatures near ambient, which was around 88˚F, while the inlet temperatures consistently hovered around 260˚F. I’m showing this confirmation that the thermal image test will hold true in not just shop conditions, but in the most abusing of real-world driving as well. Pressure drop needed analysis as well. Our core stabilized the somewhat turbulent inlet air pressures that surged through the stock core. It was a slight reduction, but something to note. Our graphs show that the pressures through our core are smoother. 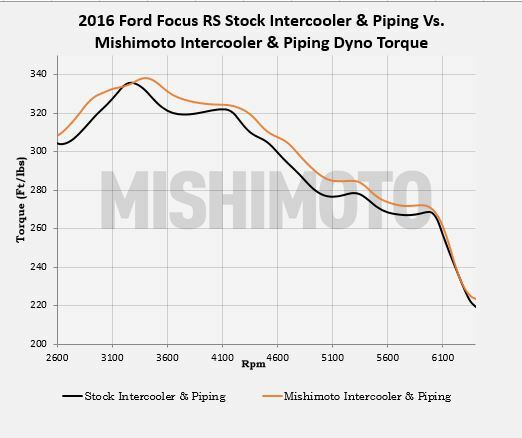 While this may not seem like a huge deal, straight and consistent airflow is vital for upgrades involving tunes and bigger turbos. It will play a big part in seeing the gains you want when you upgrade for more power. And see below for an overall comparison between both plots for outlet pressures. Slight, yet important pressure improvements helped us make a nice bit of power over stock. 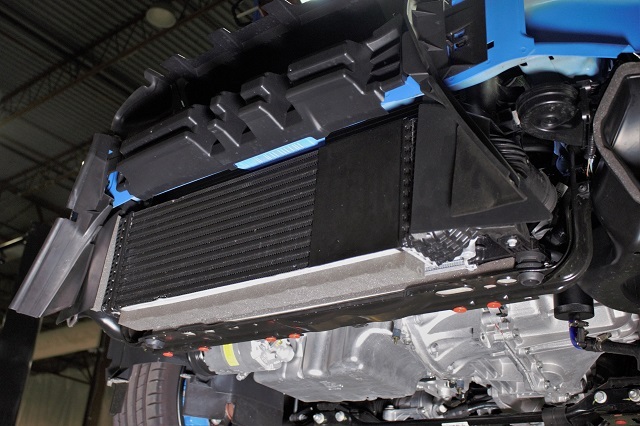 With our intercooler prototype and stock piping, we saw gains of 7hp and 8 ft-lbs of torque. What this tells us is that efficiency has improved. 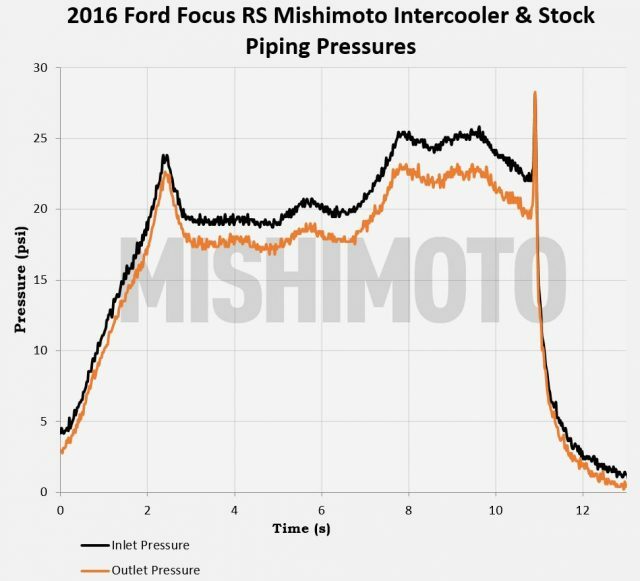 It’s helping the engine make power, which isn’t always a guarantee on cars that base their air intake readings off manifold pressure, like this RS, compared to cars that get their readings via mass-airflow sensors. 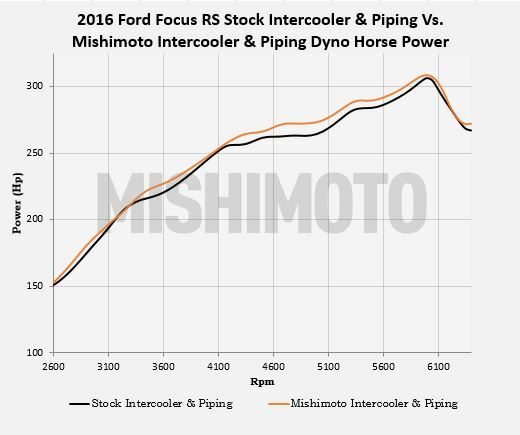 While we are already seeing these gains on an RS with a base tune, we’d be curious to see how it will hold up to a tune. It isn’t something we have time to officially test though. 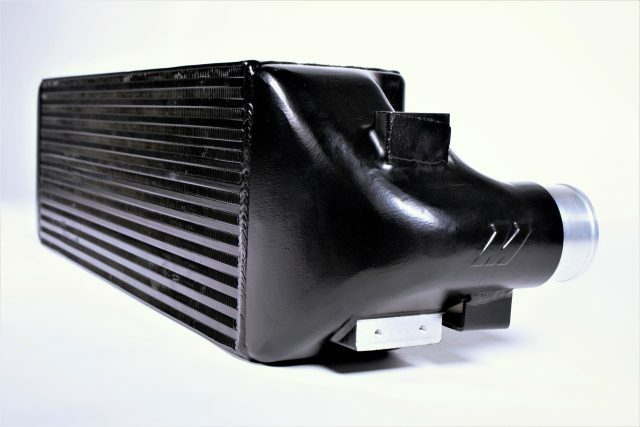 The presale for this intercooler is slated to start within the next two weeks! Stay tuned for the pricing information and official release date. What do you guys think? Let's discuss it! 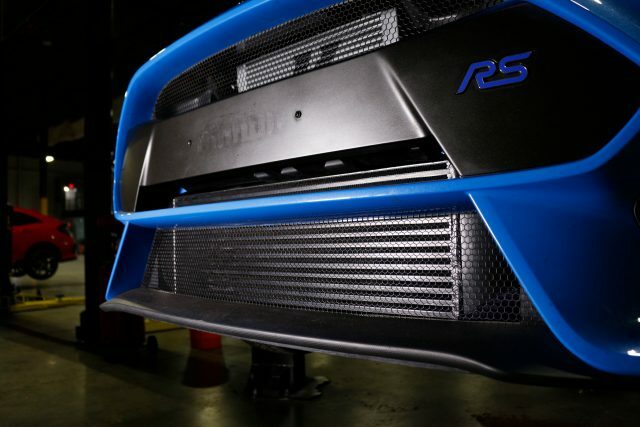 We are making our presale for the 2016 Ford Focus RS Performance Intercooler live! 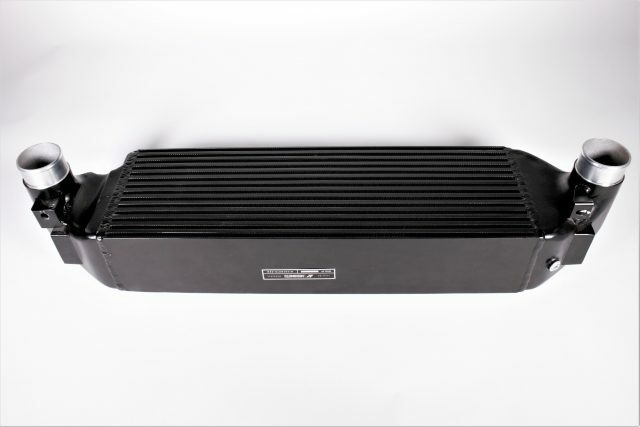 During this period, you can get our intercooler for the 2016 Ford Focus RS at a great discount before the final production kits hit the warehouse and the market. This presale will be going on for several weeks, so you have time, but don't wait too long! Please check out the details below and please let us know if you have any questions! Again, please let us know if you have any other questions or concerns! [MENTION=17]Mishimoto[/MENTION] is a tune required to take full advantage of this upgrade? The core itself will give you a bit of a bump in power without a tune, and it's completely safe to run with a stock tune. However, a tune is certainly always suggested for these types of upgrades. Since a larger volume of cooler, denser air is being flowed through the system, a tune will definitely hone in on the changes and provide great power potential. Your choice! Thank you for taking the time to provide us with such an informative data set. Impressive.